You know how the husband of the Proverbs 31 Woman is “respected at the city gate, where he takes his seat among the elders of the land”? Why do you suppose he was so highly respected? Because he’s just that cool? Yeah maybe. I’m sure he was a pretty neat guy. I think he was respected by others because he was first respected by his wife. If his wife didn’t respect him…didn’t talk respectfully to him…didn’t talk respectfully to others about him…why in the world would others respect him? I am not an expert. Nor do I think that the following statement is absolute across the board without exception. I believe we as women have the power to make or break our man. Without a doubt, a big part of who a man becomes is completely up to him. You can not change your husband because ultimately he must make his own choices and decide who his God is. I believe that the way I treat my husband; the way I respect him, talk to him, listen to him and talk to others about him can have a huge impact on the choices he makes and the man he becomes. I think I could slowly but surely break my man. I can build him up and make him into more of the man and husband God wants him to be. Would I want him to talk to me like this? Would I want him to look at me this way when he’s talking to me? Would I want him to talk to his friends about me like this? Would I want him to talk to me in front of other people this way? Hey…I don’t want Matt to talk to the guys about what a dork I was when I forgot to pick up the stuff he asked me to pick up at the store yesterday. I don’t want him to gripe to his buddies about how annoying I am when I leave cabinet doors open time after time. Why in the world would I think it would be okay for me to whine and gripe about him to my friends? Now…is it ever okay to vent to a friend and share concerns in your marriage? Absolutely. I think women sharing with women can be healthy and helpful. But I think it is VERY important to pray about it first and consider the outcome of the conversation. You want your friends (and family) to still have respect for your husband after your conversation. Speak wisely. Share with us: Not only is it a good idea to NOT SAY negative things to others about your husband, it’s also a great idea to say lots of positive things about him to others! 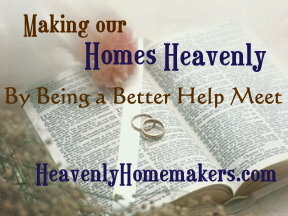 Please take some time to share with us some of the great things your husband does for you and your family. Go ahead…start bragging! If you aren’t in the habit of sharing great things about your husband…this is a great place to start! Yes– I’ve seen examples of both of these kinds of marriage, and the one is heartbreaking while the other is inspiring. Thank you for talking about this and reminding us of the power of our words and attitudes. It’s easy to forget that. My man is the best!!! He over looks my flaws, defends me verbally in front of others, speaks the truth in love, helps me, is growing in the Lord, and is my lover and best friend. I truly am blessed beyond words. My husband is the most AMAZING father. He tirelessly reads thousands of books to our boy, pulls him around and around and around the house on his car, gives a bath every single night, plays cars and airplanes and hummers and basketball and wrestles around on the floor with him. He never discourages me when I need a night out w/ my girlfriends, even though it means he has to do the entire bedtime routine by himself. My husband loves and protects and provides for his family with all that is in him. I am blessed. My husband? He blows all the other men out of the water!! Sorry ladies. We are unable to have bio children, but did that phase him? No!! We now have two children in our home because he is so unselfish. He was willing to use our entire savings to bring home two children. Not only that, but he now is the best dad ever. Just yesterday he spent well over an hour digging a snow tunnel for our children to crawl through. He loves them so much. And he loves me so much. He would do anything for me. I know he would. He works hard to put food on our table and to pay the bills. He encourages me to take an evening off once a month to go eat dinner with my girlfriends. He gladly takes on or both children to work with him if I have a desire to just go to town on my own. Who is the selfish on here?! He is the man that God desires him to be and is growing spiritually every day. He is truly the spiritual leader in our home. God has so blessed me by placing this man in my life. Thank you for this post – even when the information is known intellectually, I find I can never hear it enough for it to soak into my heart, mind, and soul as well. My husband is so wonderful. He is a wise and generous provider, a strong leader, and an amazing friend. I am constantly reminded how perfect God’s plan is through our marriage and our complimentary roles and personalities. Recently, we’ve been working through a period of unemployment and I have such admiration for how my husband has handled the stress and uncertainty associated with this. After salvation, he is the BEST thing that has ever happened for me! One of the things I did for either Valentines Day or our anniversary last year was to make a list of 100 things I loved or appreciated about him. I gave it to him as my gift to him for that particular event. I also told him that I would continue to add to the list. My guy is pretty quiet about such things, but I think he appreciated it. Nope, MY hubby is the BEST! While other wives give their hubby’s quiet time after work, for them to unwind. My hubby does’t want any. he wants to come in and take the children off my hands, especially on my days off. He hasn’t seen the children all day, and he wants to be with them. he works tirelessly, and just wants to come home to be w/US. He gives me time to unwind, by putting my feet up, (or whatever else i want to do) which if I were on them all day is A LOT! he’ll give me a back rub and a foot massage w/o even being asked. And does not expect one thing in return. My dh works 5 days a week as an attorny (M-F) but so many hours I can’t even begin to count. I work as a nurse and my days and shifts vary. So our greatest joy is in being w/our children, and each other. That’s just one way my hubby blesses me everyday! What a great post! For the last several years, I have been working on keeping not only my public remarks and comments about my husband positive, but also my own personal thoughts about him. He is a hard worker, a good provider, a dedicated father and the spiritual leader of our home. I truly have much for which to be thankful! On days which I have considered all his good points- it is so much easier for me to speak respect and pride into him when he comes home from work. On days which I have considered his flaws- it is very hard for me to speak respect and pride into him when he comes home, and the most I can settle for is to not say anything negative. What a difference all those “thoughts” through out the day make! My husband is wonderful! I can go on and on about how great of a husband he is, but what astounds me is that he came from a ‘broken home’ where he didn’t have an example of what a godly husband/father was supposed to be. So the fact that he is the way he is shows me how God can take a life and turn it around. Our family has had it’s share of trials and hard times and it has just made us closer/stronger as a family. He is a Super Daddy to our little boy, showing him how to respect others, to ride a tricycle, and how to give a really good hug. He is the best husband ever, too. He’ll give me time to myself when I’ve had a long day and our son’s being a typical 2-year old. I feel completely blessed to have him as a husband and to be able to raise our son with him. God sure knows how to make ’em. While I strive to be a good helpmeet for my husband, and we have a great relationship and a wonderful marriage, my husband still suffers from very poor self esteem. It used to really bother me because I thought that if I was a better wife, then he would feel encouraged or more positive about himself. I have learned – in the 13 years that we have been together and the 12.5 years that we have been married – that it is not my burden to bear. I can encourage and support him and be respectful of him to family and friends and even directly to him, but I cannot make him feel better as much as I would love to do that! I pray often for him to feel more positive about himself, but that will be God’s doing…not mine. All I can do is love him, pray for him and lift him up. I got so much more than I deserve when God blessed me with my husband – and I can assure you that neither of us is perfect…but we are a perfect fit. God’s plan is always right! I have an absolutely wonderful husband, and thankfully I have a mom who practiced what you spoke of in this post. It makes a marriage easier when you’ve grown up watching a great one. My husband loves to shop – I don’t. He even does clothes shopping for me and gets it right about 99% of the time. He loves all of our children and does everything he can to help me with their care. He brags on my cooking and constantly encourages me to become a better wife and mother, to develop my skills, passions and hobbies. I am so glad God brought us together. You should tell him real men cry. Nothing is more beautiful then seeing my husband worshipping our God. And MANY times he does cry. It’s never once bothered me to see him cry, and I tell him, I’d rather you cry out to God, and worship him, then to show no emotion and have no emotion towards God. Ephesians commands husbands to love their wives and for wives to respect their husbands. I recently read Love & Respect: The Love She Most Desires; The Respect He Desperately Needs by Dr. Eggerichs. He made the point of saying that it’s easy for women to take the first half of the verse, “Husbands, love your wives as Christ loves the church,” and stand up and say, “You’re supposed to love me unconditionally!” However, women aren’t taught and wedding sermons aren’t given on how women are to respect their husbands unconditionally. When a wife is loved, she feels loved and respected; when a man is respected, he feels loved and respected. I think God created us that way for a purpose. In this book, the author said that he has seen marriage after marriage after marriage improve 100% when the wives just simply say to their husbands, “I respect you,” with the same vigor and sincerity that they want to hear, “I love you,” from their husbands. our church doesn’t have the traditional boring vows. Our pastors have a book by Kenneth and Gloria Copeland, I can’t remember the name of it. And in it, are the great wedding vows we used. It goes thru 1 Cor 5 (I think it is) about how the relationship of the husband and wife OUGHT to be. Thank you for posting this. I am glad to be reminded of it. Sometimes it is easy to get off track and focus on the the “bad” things about our husbands. My husband is my best friend and my lover. I love being with him and our children. But sometimes I forget that and become that nagging wife that I don’t really want to be. My husband rocks because he is always there for me. I always experience extrememly bad sickness with my pregnancies. He has always been patient with my sickness and my slack in the house work. He has always been willing to help with the children and the chores even after he has had a long day at work. And he is so incredibly patient with my sin. He is a blessing to have by my side through my sanctification. The whole of “Wife of Noble Character” is on the virtues of this woman. I think one of her virtues is that she picked a man that is respected and of noble character himself. We do need to build each other up in love and respect. This is part of having good character. I love having a husband that totally respects me and lifts me up! He is always positive and thoughtful; strong and stable emotionally. He is wise. He is genuine. Thank you for your post! I SO needed to hear that! My husband is wonderful! He works so very hard so that I can stay at home with our kids. He has always accepted me, no matter what. I am truely blessed to have the husband God gave me! My husband is the most fantastic man. When I had my daughter and my son I was very nervous for him to go back to work. He gave me the best advise out of everyone. He told me to “just keep them alive.” Whatever doesn’t get done, whether it’s dinner or sweeping floors, or even getting them dressed it doesn’t matter. As long as they are alive at the end of the day I’ve done my job! Some days are harder than others and I have to let stuff go so that I can focus on just keeping the kids alive at the end of the day, but just knowing that my husband loves me enough to appreciate how hard it can be is immeasurable in my book. God has blessed me the with best husband, and I thank God for him everyday. When my husband and I got married a few ladies from church hosted a spiritual shower for me. Basically they all came and wrote down things that would help me in my marriage. Some women were old, some were young. By far the resonating theme among them all was to revere my husband by never speaking bad about him to others or in other’s presence. Such great advice and I’m glad I heard it early. It really bohters me now when I hear others talking negatively about their husbands in a group of other people. Thanks for such good thoughts! Can I suggest a terrific book that handles this very topic (among many other great ones)? It’s titled “Created To Be His Help Meet” by Debi Pearl. I was honored to receive this book as a wedding gift from a woman I hardly knew, and it turned out to have one of the greatest impacts on me personally and in my marriage. I HIGHLY recommend it!! He is a better parent and spouse than I am. He is definitely the Spiritual Head of our home, and I am SO thankful for that! Thank you so much for these wise words. I’m not married yet but this is definatly something I need to work on with my boyfriend. He deserves respect and honor and that is what he gives me. Thank you for this much needed post. you’re so right. a lot of times i catch myself saying or acting in a way that is not respectful towards him. i do need to watch how i respond to him and how i treat him in front of others. thank you for this reminder! Oh my . . . God spoke directly to me through this post this morning . . .
Usually I am very aware of my attitude sets the tone in my home and my relationship with my husband of 21 years. Lastnight we were out with business friends of his, people I know and really like. But my husband did a couple of things that ticked me off. I have been creating the scenerio in my mind how I would tell him about it all morning. Thank for remind me instead to thank him for including me in the evening out. Mike and I are married 29 years, plus we dated 9 years prior to that, so we’re together nearly 40 years. (I’m 54, for the record.) It was established long ago that there would be little or no mean-spirited teasing or putting down. I just don’t get these couples who have nothing nice to say about each other. They disguise tension in their marriage with sharp humor. “I’m with Stupid” shirts make me cringe, btw. Uh…this is supposed to be the person you married because you loved her/him? Of course we have our disagreements, but I can count the big ones on one hand and still have at least a finger and a thumb left over. I guess I’m saying we just plain NICE to each other, LOL! Nice leads to wanting to be together, which leads to…never mind, you know. I’m still romantically in love with the guy! This was great to read! I definitely find it easy to get swept away in the venting-about-my-husband sessions over coffee with girlfriends….I read a book last summer called “Words Begin in our Hearts: What God Says About What We Say” by Rhonda Webb and it inspired me to speak slowly and open my mouth in wisdom! If you ever have the chance to attend a Love and Respect seminar or to watch the DVD’s by Emerson and Sarah Eggerich, do it!!! My husband and I just watched the DVD’s with our church and it is extremely beneficial. My husband NEVER leaves cabinet doors open, and I ALWAYS do, and he NEVER jokes about that with his friends! My husband is everything I need in a husband, and I’m so thankful at how God has provided for me by matching us up. My husband is an extremely hard worker. He works from early morning (7am)till late evening (8pm)just so his family has the option to homeschool and so that I can stay home with them. He is resourceful and very talented in his profession as an auto restorer.